In 1958, Bang & Olufsen introduced the first stereo pickup cartridge ever made in Europe. This was called the SP1. Since then, many design innovations and the creative use of new materials have kept B&O's cartridges at the forefront of audio technology. 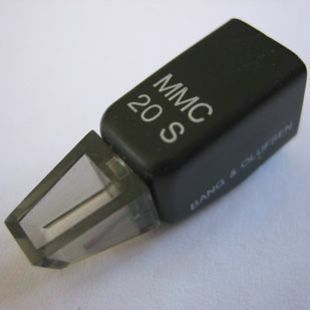 By 1979 - 80, Bang & Olufsen's cartridges were represented by the MMC 20 series. MMC stands for 'Moving Micro-Cross'; the patented moving-iron principle upon which all B&O cartridges were based. This unique system employed a cross-shaped armature which, among other advantages, guaranteed exceptional stereo separation since each channel moves on a separate axis. The job of any pickup cartridge is to transform the record's physical profile (groove modulation) into corresponding electrical signals (which are then amplified or enlarged by the amplifier and turned into audible sound waves by the loudspeaker. A cartridge must perform three separate and exacting tasks if it is to do this job successfully. It must function mechanically (the movements of the stylus in the groove); it must function magnetically (using the physical movements to create changes in a magnetic field); and it must function electrically (using the changes in magnetic flux to generate an electrical current). At each stage, one type of energy is transferred into another, quite different, type. And the transfer must be perfect, with no energy lost and none added from extraneous sources. No cartridge will ever reach this ideal unless the Laws of Physics can be repealed. However, by understanding the relationships between the three transfer stages and continually applying refined engineering techniques, B&O's belief was that each stage of cartridge improvement would bring each successive cartridge closer to the ideal. The MMC20 series therefore represented the closest that modern technology at that time, could possibly afford. If you take music seriously the value of your record collection is likely to be high. Many of your records are likely to be irreplaceable. You will also know that the signals pressed into your vinyl discs are very fragile indeed. The pickup cartridge can be the disc's worse enemy since an ill-suited cartridge can mark a record for life in a single play. While B&O is aware that cartridge specifications are inter-related, their research shows consistently that Effective Tip Mass (ETM) is one of the major factors affecting record wear. ETM is the equivalent of the amount of inertia the groove 'sees' in moving or accelerating the stylus tip. Consequently, the higher the ETM value, the higher the force required for a given constant acceleration. Obviously, more force results in more wear. Three elements contribute to ETM. The stylus tip (diamond) contributes with its entire weight and mass. The armature contributes between 5 - 20% of its weight and mass; the cantilever around 30%. B&O has been able to reduce ETM substantially by refining these elements and building them into an integrated unit. The result is a system which not only reduces damage to the groove walls dramatically, but also provides exceptional performance at all frequencies. 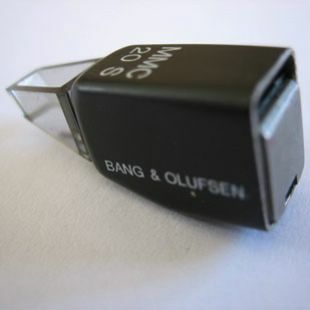 Bang & Olufsen cartridges have always been highly acclaimed for their low ETM values. 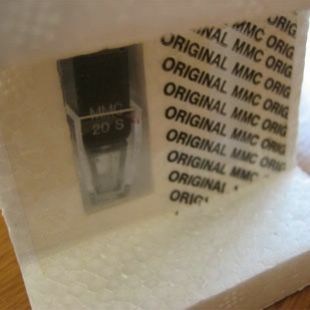 The ETM of the MMC 20CL is a mere 0,3mg and in the standard MMC 20 range,, only 0,5mg. MMC cartridges were manufactured by Bang & Olufsen as totally integrated units. This means that the elements were matched, balanced and sealed at the factory. Using a computer-supported testing programme,, each sealed unit was meticulously tested and it's performance information automatically registered and packed with each cartridge. The information given included output voltage, relative voltage output (channel balance), channel separation and frequency response. Individually-calibrated frequency response curves were also supplied with the higher-specified MMC 20CL cartridges.